HomePersonal GrowthMake a 2016 Vision Board – 4 Creative Tips & A New Workshop! 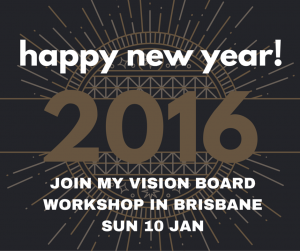 Make a 2016 Vision Board – 4 Creative Tips & A New Workshop! This post explains how you can make a Vision Board to call in your dreams and goals for 2016. A vision board is a collection of images and stories, which inspire you at the Soul level. We become what we ‘eat’, whether that’s food, ideas or opinions. That’s why I’m so careful with what I allow into my life. Everyone has 24 hours a day, but it’s what you do with that time that determines your success. Want to create a 2016 Vision Board? Please bring: An apron or old t-shirt, 4-5 magazines, photos or postcards that inspire you and snacks (cafes are nearby). Fee: $150 prepaid or $170 on the day. Only 6-8 spots available, so be quick! 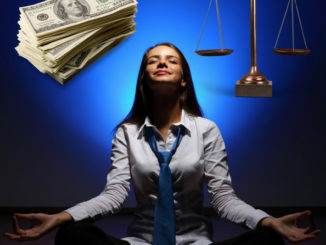 If minimum numbers are not reached, you will be offered a refund or place in February (date tbc).This price includes a mini-reading (in a group setting) and a 2016 numerology talk. Book via SMS to 0408 898 028 or email meDue to pregnancy, this is one of my last workshops until June 2016. 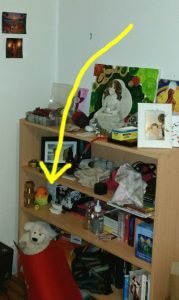 Yesterday, I was speaking to a friend on the phone when one of my vision boards flew off the wall (see photo). I’d been wondering whether to update this particular board, and figured that this was an emphatic ‘YES’ from Spirit. Although our conscious mind operates on logic, our subconscious mind responds better to images and feelings. A vision board allows you to ‘program’ your inner self for happiness. It’s amazing what happens when you send clear signals into the Universe.Although our Spirit Guides are always around, they wait for us to make a decision before jumping to assist us. That’s how we learn the power of free will and positive intention. Our Guides love when we are specific. Imagine walking into a restaurant – if you just order ‘food’ you’ll confuse the staff, and could get anything on your plate. On the other hand, if you ask for a ‘margherita pizza’, you’re more likely to get what you want. How do I make a Vision Board? There are no set rules, but here are 4 creative tips for making a powerful board that truly represents your Soul’s needs. 1) Make it fun, not a chore. Vision boards are an intuitive tool, and should be made in 1 or 2 sittings. Cut or tear pictures from magazines, add photos, quotes or any other souvenirs that you feel drawn to and keep them in a box. When you are ready to create a board, arrange the images based on your gut instincts. Don’t aim for perfection – a messy board is fine! After all, beauty is subjective. 2) Don’t compare. It’s wonderful to create a vision board with friends or in a class, but avoid the temptation to ogle other people’s work. We all come to Earth with an individual life purpose (find your lifepath here) and only you know what will give you joy. 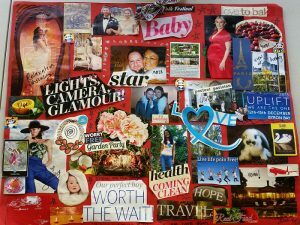 Vision boards aren’t an art project, they’re a he(art) project! 3) Put your board somewhere obvious. The more you celebrate your vision, the faster it will come true. I keep my boards in my study. Some people put them in their bedrooms, but I find that a little distracting – each to their own. Each time you look at your board, focus on at least one image and visualise it coming true. What would it look, sound, feel, smell and taste like? 4) Let it go. As with all manifestation, it’s important to ‘stay loose’. There’s a fine line between chasing your dreams and stalking them! The way I see it, if you put in 100% effort and something doesn’t come true, it’s because Spirit has a greater plan for you. You’re not being punished, just redirected. Whenever I pray for something, look at my vision board or create a wishlist, I finish with ‘please send me this, or something better for my highest good’. That way, my Guides have room to surprise me! 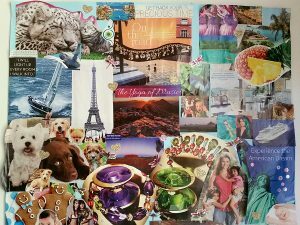 When should I make a Vision Board? Between a New and Full Moon is ideal, as that’s the perfect energy for bringing in freshness. It’s also a wonderful way to start each year (hence today’s post). I’d also recommend making a board around your birthday, when you start a new Personal Year in numerology (Find Your Personal Year here). How do I know if my Vision Board is working? Easy! If you feel good when you look at your board, it’s working. If you feel nothing, or it starts to depress you, consider updating your board – maybe your needs have changed or you were too ‘in your head’ when you first made it. There’s a big difference between what our mind craves (e.g. power, control, looking good), and what our heart knows will give us peace! -The first thing to appear was the big shower head (see top left corner). When my soulmate Kris installed a fluoride filter, he upgraded our shower so I could enjoy a ‘waterfall’ everyday (read more on water and your Third Eye Chakra). -I went to all the festivals listed (Woodford, Uplift etc), had my garden party, made that strawberry tart and found a way to live life ‘pain free’ (see this list of my healers) after years of neck issues. -I didn’t buy the leafy house on the Gold Coast, but I did live somewhere extremely similar with friends! -Kris and I stayed together despite some harrowing times. At one stage, we were fighting all the time, and I took down this vision board because I couldn’t stand the pictures of us. Kris walked in, and without saying a word, put it back on the wall. I burst into tears and we reconciled. Now we are engaged and expecting our first child, Forrest Bump (read more on my psychic baby). Just like the board says, it’s a boy and he’s been ‘worth the wait’. Who would have thought, a sheet of cardboard with pictures on it could make such a difference?! 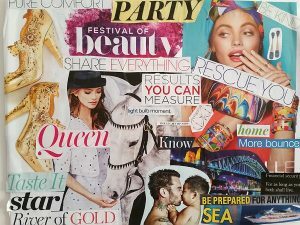 I hope this article will inspire you to make a vision board for 2016.Here are some of my latest creations to give you more ideas. Your 2016 Numerology Forecast – Will you rewrite history? You can also subscribe to my e-news for articles (see homepage). Here’s the Christmas 2015 edition. Or write to me below, or via email. Comments will be published once approved. Want to know your future? Book a phone or Skype reading with me to discover your life purpose and 2016 forecast. My next sessions are in May/ June 2016 due to pregnancy – join the waiting list here. It’s worth the suspense, as you’ll receive an extremely accurate reading – see over 75 previous testimonials. Other workshops and past life regressions will recommence in mid-2016. Until then I am referring regressions to Julia Chai and Vicki Haspels (who also does psychic readings). Mention my name for a $10 discount.